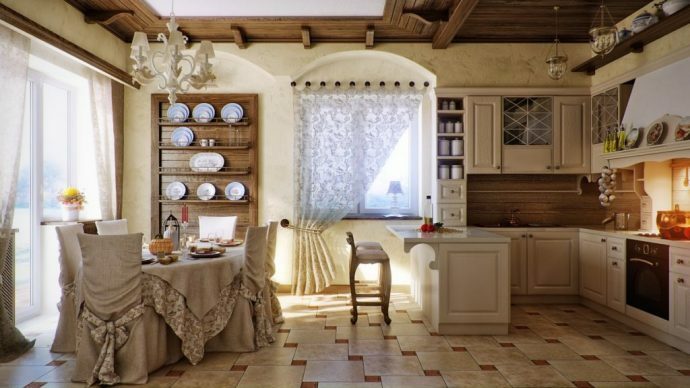 The interior style of Provence is based on the designs cosy rural houses, located in the same village. It is situated in the South of France and bordering the Mediterranean sea. The style associated with Provence côte d'azur, flowery meadows and sun-burned colors. Interior in this style just looks, but, at the same time, has its own charm and a certain elegance. The design is bright, spacious and light, so, like no other, suitable for decoration of bedrooms. Provence is characterized by the presence of a large amount of natural light. Windows should be large, skipping sunlight. The color palette is comparable to sun-bleached tones. Use only light shades. Основные цвета – это кремовый, white, beige, pastel pink, pistachio and blue, light grey and purple. Bright, "shouting" tone is unacceptable. Materials in the style of Provence uses natural. The ceiling in the bedroom is usually whitewashed or painted in light colors look. Often it are the white wooden beams. Or wall shall be rough plastering and painting, or pasted Wallpaper with a floral print. Perfect finish for floors in the bedroom is solid wood. But you can do parquet or laminate, simulates a natural tree. Feature of the furniture in Provence style is its aged look. The design is made of natural wood and painted with white paint. Elements are forged parts or drawings of flowers, made in decoupage technique. The bed is the focal point of the room. It byltsa are made of wrought-iron or wooden base with a small thread. But the lines of forging, or thread should not be too artsy, in order not to resemble a Baroque style. 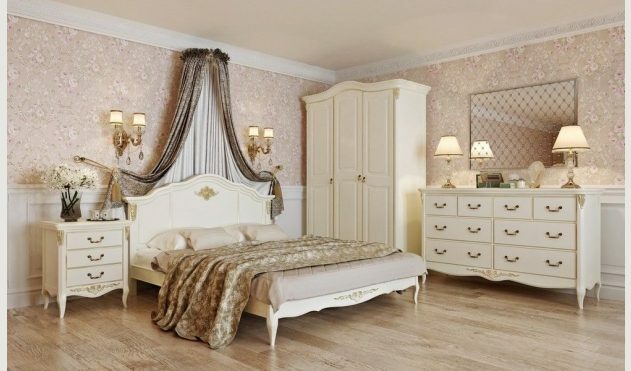 Here is a good directory furniture in Provence style, if you are in Moscow, there's a great choice, along with the standard cabinets, beds tables and chairs, are unique products, typical of this style, such as: sideboards, chests, dressers, скамьи и буфеты. 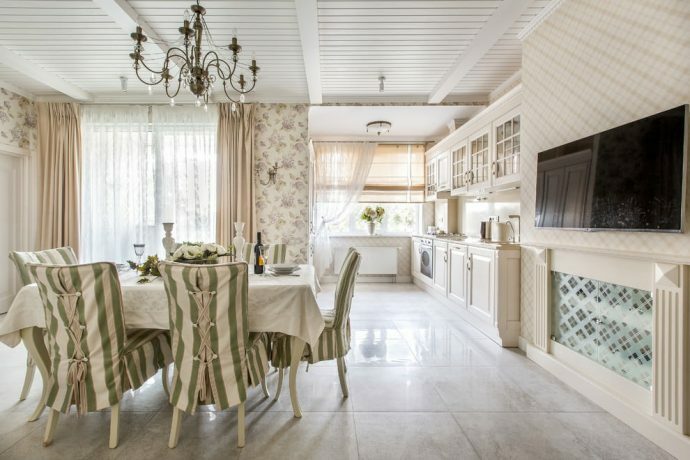 Beige color scheme, white, under the style of antique pine, etc. Padded interior bedroom wardrobe, doors that have cracked view. Bedside tables and vanity table should stand on a low carved legs. The mirror is framed with wrought-iron or carved frame and sits on a dressing table or standing at the wall. 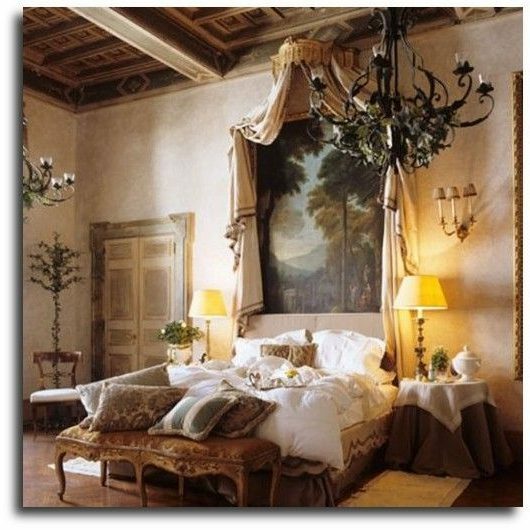 The highlight of the style of Provence, especially for the bedroom, are the flowers. 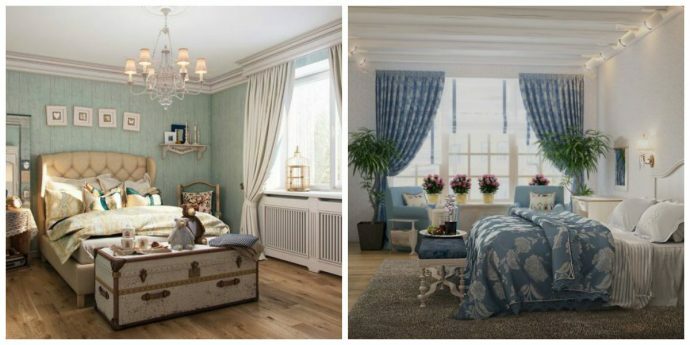 They portray on the curtains, bedspreads for beds, the decorative pillows and on furniture. On the windowsills there are always flowers in pots, and on the dresser and nightstands are living bouquets in ceramic vases. In the bedroom under the Provence you can see a lot of statues, photo frames and boxes. The hallmark of the style is a rooster figurine. The chandelier is made of wrought iron, and bedside lamps and sconces upholstered in a knitted lampshade. 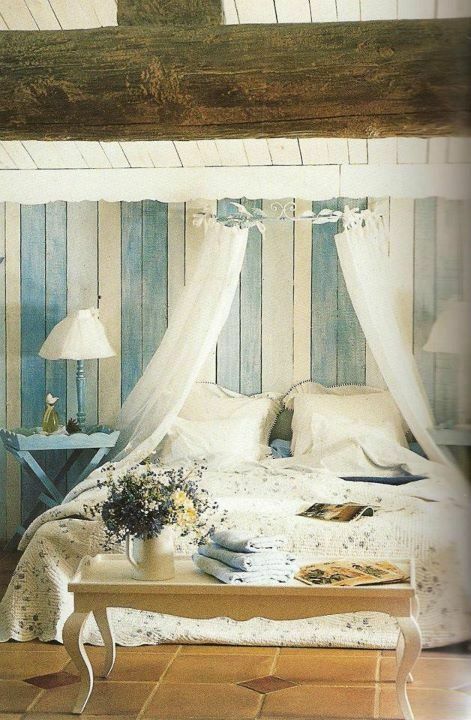 Bedroom in Provence style looks very elegant, but retains a rural simplicity and a house by the sea. Her warm, calm tones promote relaxation and set the tone for the rest. 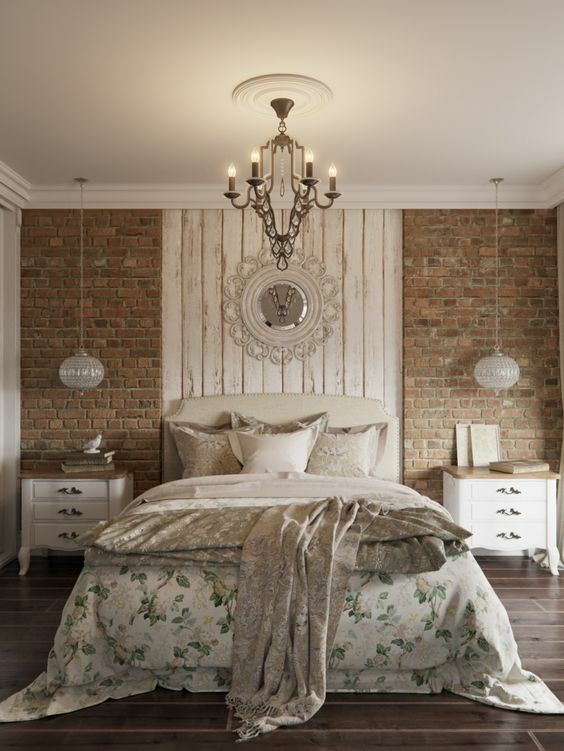 Bedroom design, to a greater extent rich textiles, suitable for dreamy and romantic woman or girl. A lightweight version of the style of Provence will become a family nest for a loving couple.